Mainsail is on a furler aft of the mast. 12 volt, 5 batteries charged by: engine, wind generator, solar panels, shore power, generator 3 x gasoline generators. Battery charging ... Generator sited on deck 4hp Honda driving an 80 amp/hr alternator using a special regulator, AirX wind generator, 300 watt solar panels with solar controller and 80 amp main engine alternator. 6 x 20 litre Jerry cans for extra diesel. Spare 6 Hp Evinrude 2 stroke outboard. Storm boards for cabin windows. A rugged motor sailer, built by her owners, who have spent the last 18 Years cruising the Pacific, Asia, the Philippines, Taiwan and most recently Japan. However the time has come to swallow the anchor and continue exploring the world in a bit more luxury. 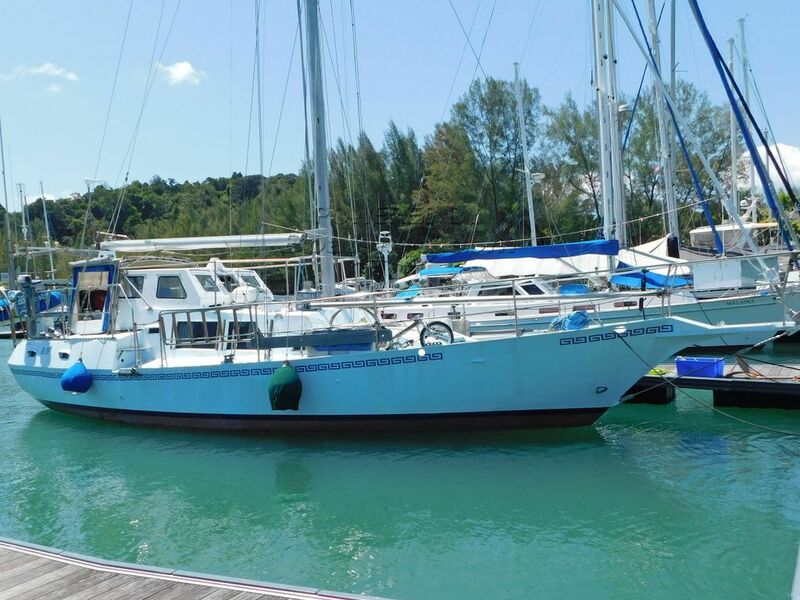 She comes complete with a vast inventory of spares and equipment, a compressor and air tools, welder, pressure washer, electric hand tools, engine spares, no less than three Generators and much much more ( full inventory on request ). Recent upgrades include four new aluminium fuel tanks and fuel delivery system, all new ARCUS standing rigging in 2017 and haul for bottom paint and anodes in July 2017. This Fairwind Custom 46 has been personally photographed and viewed by Alan Giles of Boatshed Langkawi. Click here for contact details.